DETROIT/BEIJING (Reuters) - Electric luxury car startup Faraday Future, one of several Chinese-funded companies taking aim at Elon Musk's Tesla Inc <TSLA.O>, is throttling back on plans to build vehicles in the United States, the company and public officials said. Faraday, an affiliate of Beijing-based Leshi Internet Information and Technology Corp <300104.SZ>, has also pared its planned product portfolio down from seven to two vehicles, according to two sources with direct knowledge of the company's plans. Faraday will build a much smaller auto assembly facility than originally planned in North Las Vegas, Nevada, a city official said late on Tuesday. North Las Vegas city manager Qiong Liu said Faraday told the city it will build a 650,000-square-foot (60,390-square-meter) facility, beginning later this year, on the site of a plant originally planned to take up 3 million square feet. The downsizing follows an acknowledgment last fall by the company's founder, Chinese tech entrepreneur Jia Yueting, that his global operations were overextended. Former Faraday executives have said the company struggled with cash flow issues almost from its inception. At least a dozen key U.S. executives have departed Faraday in the last nine months, according to the company and several of those executives. In a statement, Faraday said it still plans to eventually construct the larger plant, but gave no timetable. Faraday is still hiring contractors to begin building the factory shell, according to a source familiar with the plans, but there is no firm date for completion. "We remain committed to the State of Nevada and are continuing our $1 billion investment in the region over the next few years," Faraday said in the statement. Faraday announced plans in December 2015 to build its first auto factory in Nevada, with an annual capacity of 150,000 and a planned opening in late 2017. Documents submitted to the state showed a planned investment of $1.3 billion. Documents prepared for Chinese investors in early 2016 by Faraday's finance team and not previously made public show the company was pitching a $1 billion convertible bond offering, saying it planned to build a range of seven electric vehicles, from an ultra-luxury flagship to a tiny commuter car. 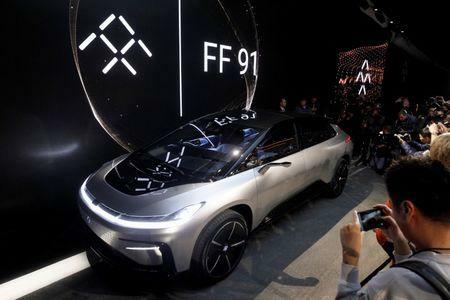 Now, the company has scaled back its initial product portfolio to just two models -- the FF 91 flagship unveiled in early January and a slightly smaller, less expensive crossover designated FF 81 and aimed at the Tesla Model X, people familiar with the company's plans told Reuters. A source familiar with the company's thinking said the smaller Nevada plant likely will be set up to build fewer than 10,000 cars a year and may not open until 2019. Faraday's change of plans comes after Jia secured a $2.2 billion infusion for his cash-strapped properties, including Faraday's sister company LeEco, from Sunac China Holdings <1918.HK>. Two sources said future production of most Faraday vehicles, and companion models for Chinese sister brand LeSee, likely will be centered in China's Zhejiang province, which has agreed to heavily subsidize construction of a new assembly plant with a 450,000 vehicle capacity that could open in 2019. Faraday stopped work on the Nevada plant last fall. Nevada's state treasurer Dan Schwartz told Reuters a $75 million performance bond required from Faraday before the state issued bonds for infrastructure development at the factory site has not materialized. Several Faraday suppliers, including seat supplier Futuris and media provider Mill Group, have sued the company for non-payment, according to court records. Jia planned to follow Faraday's 2016 convertible bond offering in China with a Series A venture capital raise in late 2017, then shift to debt financing from U.S. investors in 2018, according to one of the documents. The ultimate goal was an initial public offering in 2020, when Faraday expected to be building a million vehicles a year in the United States and China, and its projected market value would be about three times the current size of Tesla.